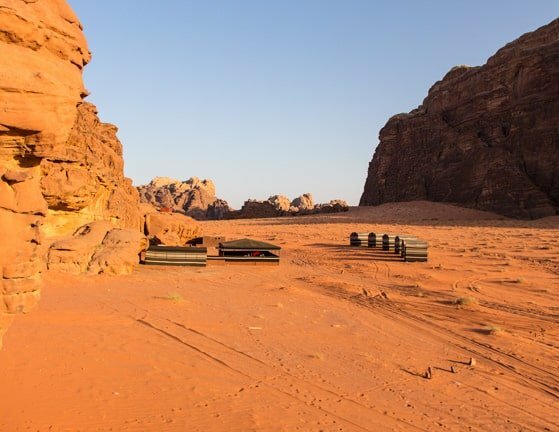 Bivouac camping is the most adventurous way to stay overnight in Wadi Rum. Enjoying a freshly prepared dinner in our cave and afterwards sleeping outside under the stars is a unique experience. Experience complete silence and the stunning nature far away from the camps. 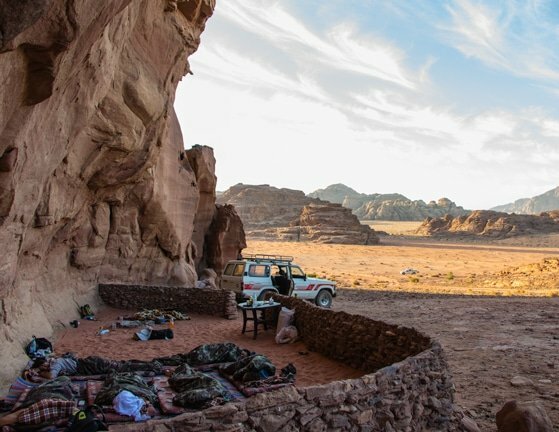 Wadi Rum Base Camp is an authentic, cosy and clean camp inside the protected area near Khazali Canyon. The camp offers the comfort of a communal tent for meals and relaxing, six 2-person tents, two 5-person tents and a bathroom building with western toilets and showers. 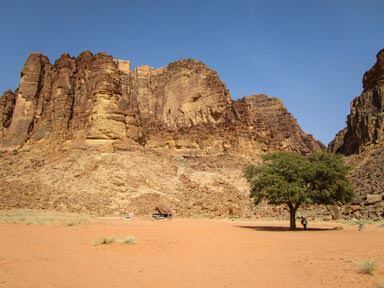 Spend a full day in Wadi Rum to explore the most famous sites. End your tour by enjoying a magical sunset. The best choice if your time is limited. Visit all mayor sites within the protected area, watch sunset and sleep under the stars. Visit the mayor sites on your first day. Enjoy a night under the stars. 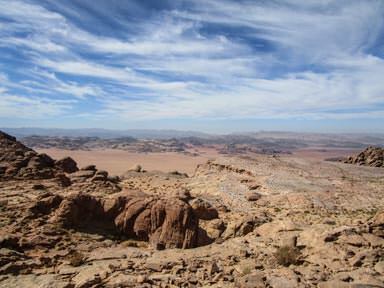 And hike up Jabal Al-Hash to see Wadi Rum from ‘up there’. Fawaz was absolutely the best guide you could ask for! Every meal left us satisfied and beyond stuffed! The hikes were breath taking and Fawaz always operated as a professional and was so fun to be around. If you do one thing in Jordan, DO THIS! Couldn't possibly recommend a better tour guide to do it with! Worth every penny we paid and more. I'll definitely be coming back to wadi rum in the future. I was met by Fawaz at the Rest House in Wadi Rum Village. I did a one day and one night tour but I could easily have done two nights. Bianca was my guide for the day and she made it a memorable one. I was amazed how Habis, our driver, never got lost!! We had a hot leisurely lunch and a wonderful chicken with rice and fresh salad at night under the stars!! I climbed up places I would never attempt on my own, with the help and encouragement of my wonderful guide Bianca. This day was everything and more than I expected - thank you all so much for these memories. An acquaintance tipped me about this trip (1 day + night) that you did with Nomads. Super pleased with the tip because it was a really cool experience! The jeep tour through the desert with frequent small walks, climbs etc. So, all-in-all a varied program. Food was very good and sleep in the desert an experience! Do not disallow yourself the trip because of financial reasons, it is well worth it!! Very pleasant and personal guidance! Went on a 2 day trip with a friend, a jeep tour and Jabal Umm ad Dami. We had a great time. The Bedouin camps were amazing, sleeping in caves and out under the stars. The guides were great and fed us very well 🙂 Would very much recommend this trip! If you look for adventure and like camping, this is your trip! Loved the camping atmosphere, being outside and the fire for cooking and tea. And finally we slept in the open air! The star sky is overwhelming and every time I woke up I had to look up. Amazing. The food was cooked on the fire for us and was healthy and super delicious. The kids loved the places we visited and the climbing on the rocks. All and all a great team! In May we enjoyed a two-day tour of Wadi Rum. In one word, fantastic! Together with our guide, also cook, we drove through the desert. At times time to relax, active climbs as you want, everything was possible. From the cave we enjoyed the sunset and then had an unforgettable evening at the campfire, delicious dinner and made music. Sleeping outdoors is very special, 1000s star and feel like you're alone in the world. Nothing, no tent, camp, toilets or running water, just one with nature! We recommend it to everyone! Fawaz and Bianca, THANKS!! Bianca and her partner of Wadi Rum Nomads took us into the desert for several hours. It was amazing, lots of knowledge and fun. They took us to all the hot spots of Wadi Rum, and afterwards we drank tea at their cave. Lovely experience, felt the desert, felt Bedouin life. I did the one day jeep tour. I had the most wonderful time, Fawaz and Bianca showed me around Wadi Rum and took all the time at all the spots we visited and were very knowledgeable about everything there was to see. They also booked my onward trip to Aqaba for me. They really went out of their way to show me the best places of wadi rum and all of the most photogenic spots. The evening and night we spent in the dessert was one I will never forget. I have really taken a lot of memories from the day we spend. They will certainly see me again for another trip and I highly recommend them. Our guide was incredibly fun and really showed us a great time. We felt like we had a completely tailored experience and were completely looked after from start to finish. A really special couple of days for us in the desert, would highly recommend! We did a day tour with Fawaz and Bianca on the 7th of February. We totally enjoyed it! I must say that Wadi Rum is the most beautiful desert I have ever been to! The trip was well organised and you can see that a lot of thought has been put into it. Fawaz prepared lunch and dinner on the 1st day and as well breakfast (although they didn't mention that breakfast is included. So that's a big plus! ) the next morning. We visited during the cold season and I was worried that sleeping in a tent will be cold but it was all good! They provided everything including sleeping bags and I had a very good sleep. I'd definitely recommend them to people I know that is planning to visit Jordan. Both Fawaz and Bianca have been great in organizing a tailored tour as I requested: staying away from the most touristic areas (not easy in Wadi Rum) and having a taste of the real bedouin life. Half day camel trip, spending the rest of the day in a bedouin tent (away from other tourists) and on day two climbing to the top of Jebel Umm Adaami, the highest peak in Jordan, and enjoying the view on the Saudi desert. Tasty and healthy food, cooked in different places but always in the shadow of a big rock or a mountain. If you want to make the best of your visit in Wadi Rum, and if you want a tailored tour as it best suits you, the guys of Wadi Rum Nomads are great! We spend a day to remember in Wadi Rum on July 2015. Fawaz and Bianca were a charming couple and they showed us many beautiful places in Wadi Rum. We fell in love with the place. The Wadi Rum Nomads-team told us so much about the place, living in there and history. The night under the stars was unforgettable! Food, service, all was great. Just amazing people and place. I sincerely recommend! Fawaz and Bianca, thank you so very much for the unforgettable trip to Wadi Rum that I will never forget! I am blessed to have got this experience with you. There is some kind of magic in Wadi Rum and I kind of feel speechless when I try to figure it out. 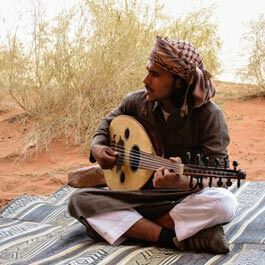 Maybe it is the whole thing, the miraculous views, the barrenness, the ascetic way of life, all the beauty that words can't describe, the incredible star roof, magical music Fawaz played with his oud... All that touched me deeply. Or as Fawaz says: "Magic is something you can not describe. It is something that happens to you. It is something untouchable." Anyway I know that Wadi Rum wouldn't have been as impressive without your excellent guiding and company! It was a fabulous tour (one day and one night). I advise to do two days if you have time because there are so many things to see! A big thanks to my guides 🙂 If you want to avoid big tents and touristic areas in the desert Fawaz is the right guide to choose. That was a great experience: sleeping under the stars in absolute tranquility - wonderful. Habis told us a lot, was circumspect, cooked delicious - everything was alright. We recommend this tour fully! We had two great days with our guide Attalah touring through the desert. He showed us the most beautiful places. Special was the short trek we have done and the visit to his Bedouin family. Sleeping under the stars at full moon was a top experience. Bianca thanks for the tips and tricks that she has given in the preparation of our trip through Jordan. There were only my partner and me on this tour and we were guided by Fawaz and Bianca. It was an awesome experience and I highly recommend this to any Jordan traveller! 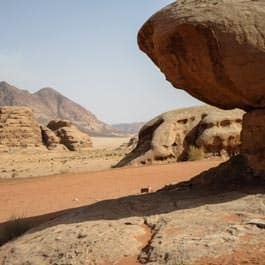 Wadi Rum with its diverse scenery is something you need to see for yourself (although you can have a glimpse of it in movies like The Martian or Lawrence Of Arabia :-)). The tour was organised perfectly and we enjoyed climbing up the rocks and visiting the great formations. We had a good time drinking Bedouin tea at the fire and I am very impressed what yummy dishes they can create just on an open fire! We did the day tour with the overnight and I was were extremely impressed by the Nomad brothers. The trip was well organized, the food was good, Habis is hilarious, and they have the most comfortable car. People in other jeeps told us they were jealous of how comfortable we looked going from site to site in the desert. You can't go wrong with these two brothers--great guides....you'll have a good time for sure. Although this was my second time in Wadi Rum, the desert was even more fascinating and beautiful and mysterious than the first time. The way how Fawaz, our Bedouin tour guide expressed and showed his love and respect for the desert, the fauna and flora, the canyons and the animals, was great. We slept under the stars, ate the food prepared by Fawaz on a camp fire, played with some camels which we passed, enjoyed an amazing rain shower in the desert with beautiful skies afterwards, enjoyed the sunset and the sunrise.... It was unforgettable and I will for sure come back again with family and friends who're coming to visit me! 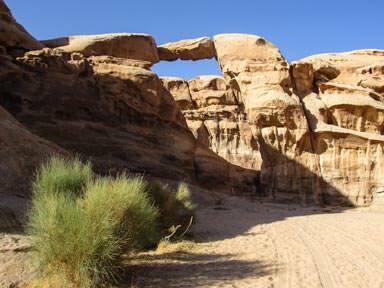 Our photo gallery filled with pictures of sites in the Wadi Rum desert protected area. Our photo gallery filled with pictures of the team members of Wadi Rum Nomads. 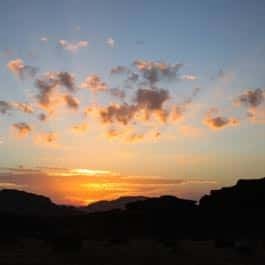 Our photo gallery filled with pictures of sunsets the Wadi Rum desert protected area.